Today’s rock review features Sodalite. Sodalite is a mottled gemstone that most often has creamy yellow to white tones and royal blue colors mixed throughout the stone in interesting patterns. However, it can also occur in grey, yellow, pink and green if its chemical composition varies. It is named for the element Sodium than can be found in its makeup and belongs to the Feldspar family. It registers at 6 on Moh’s scale of hardness. 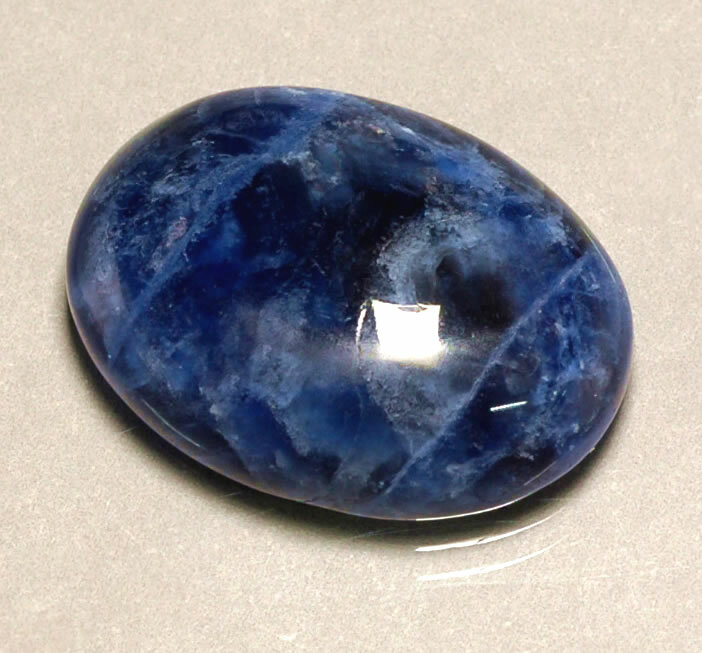 Sodalite is usually opaque, although translucent crystals can be found in larger deposits. It takes on a waxy luster when polished. Because of this, Sodalite is often found in beaded and cabochon form in jewelry. Sodalite can often be mistaken for Lapis Lazuli, however it almost never contains pyrite flecks present in Lapis. Also, it’s color is considered “Royal Blue” rather than “Ultramarine”. In streak tests, it will leave a white, rather than blue scrape. People began using Sodalite as ornamental decoration in the late 1800’s after a substantial quantity was found in Ontario, Canada in 1891. Bancroft, Ontario is known to produce Sodalite of with notably rich blue color. The mineral also can be found plentifully in Brazil and in China. Sodalite is popular among individuals who enjoy the metaphysical properties of gems. It is thought to bring calmness and clarity to the mind, encouraging rational thinking, intuition and verbal expression. It also enhances confidence, self esteem and trust. For care and maintenance, a soft polishing cloth will usually do the trick. A conservative dab of olive oil can also occasionally be used to enhance the luster and loosen dirt. This can be followed up with a quick rinse in warm water. Be sure to pat dry afterward. Because of its porous nature , Sodalite should not be soaked for long periods of time. This Week’s Rock Review features February’s Birthstone Amethyst! Amethyst is a member of the Quartz family. It owes it’s lavender to royal purple hue to the presence of iron that colors a Quartz gemstone through the process of irradiation, when iron replaces some silicon content inside a the Quartz gem. Sometimes this occurs in limited portions or isolated planes of the gemstone, rather than throughout an entire stone, leaving room for variegation in richness and depth of the color hue. Most gem cutters aim to cut the raw stone in a way that shows consistent coloring. 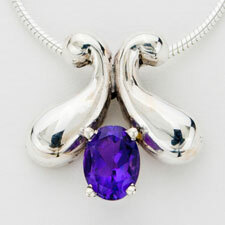 Amethyst is also dichroic, showing red violet from one angle and blue violet from another. 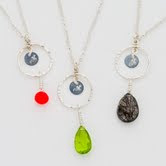 It is vitreous, making it well suited for both cut gem and cabochon style jewelry. It registers 7 on Moh’s scale of hardness. 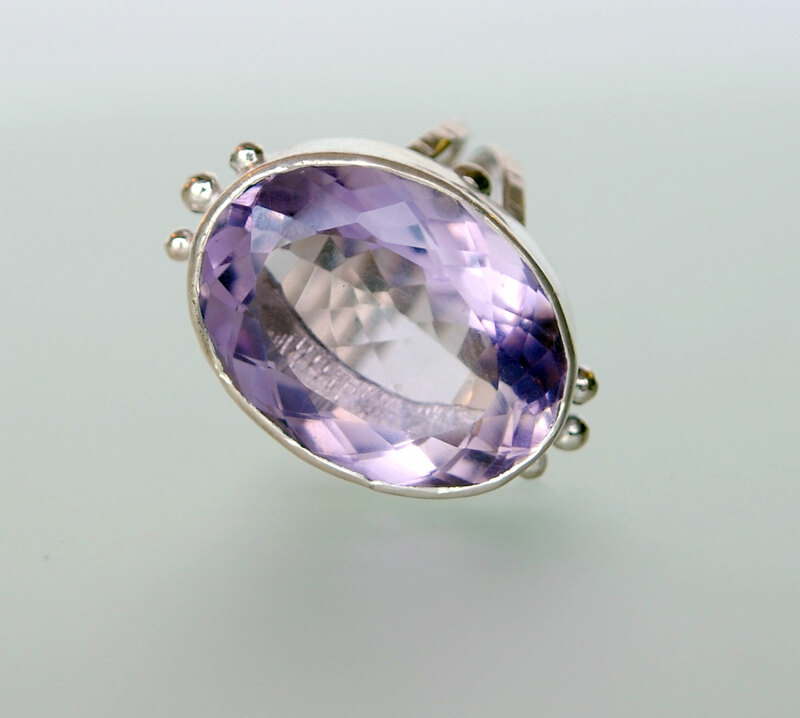 Did you know that in the modern jewelry market, you may see other colors of “amethyst” being advertized in recent years? The most common alternative color is Green Amethyst. However, the savvy jewelry shopper should know that Green Amethyst, or any other color Amethyst is not considered to be a true Amethyst. The green color advertized is actually another Quartz family stone called Prasiolite. 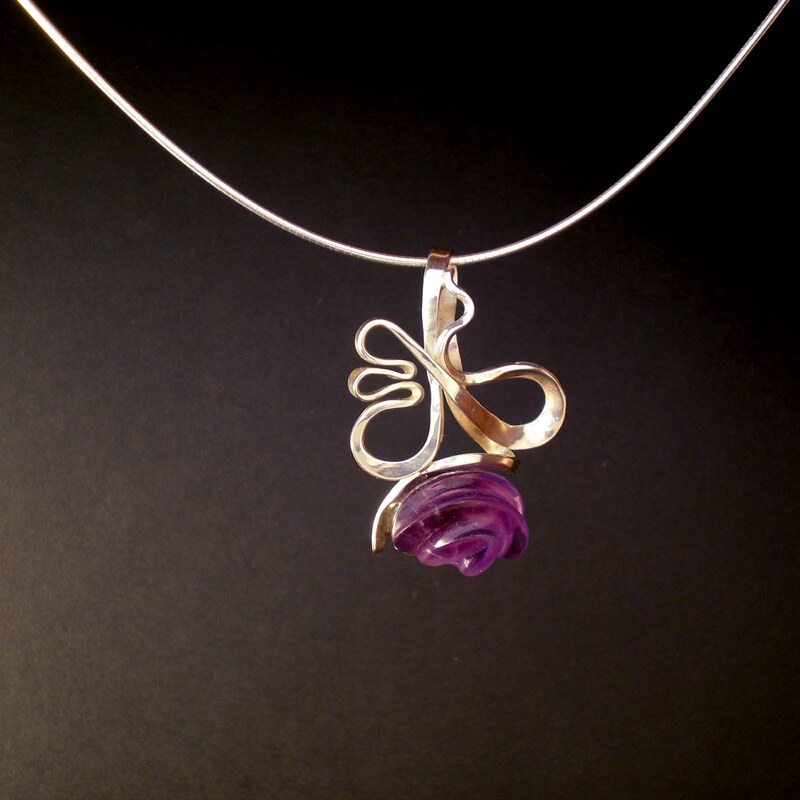 When heated, Amethyst turns a dark yellow to brown shade, similar to Citrine. It also loses it’s dichroism. When it’s only partially heated, it becomes artificial Ametrine, which features color fading look from purple to brown, almost like a dip dye in fabrics. Amethyst is infinitely valuable for many people who turn to gems for aid in healing ailments. It has been cited as particularly useful in ridding headache sufferers of pain by drawing pain away from the head, neck and shoulders, which is wonderful news to those who suffer from Migrane headaches. It also releases tension and reduces bruises and swelling. It encourages a healthy metabolism, cleanses the blood, boosts the immune system and strengthens the endocrine system. Needless to say, it’s handy to have around! Today’s rock review features the very versatile Chalcedony. Chalcedony is a Silica mineral composed of an interwoven combination of Quartz and Moganite crystal formations. Chalcedony is somewhat translucent and also has a waxy sheen that becomes vitreous when polished. It can occur in a wide array of colors, although it most often is found in brown gray or black tones. Many semiprecious gems are actually just different varieties of Chalcedony. Some examples are Agate, Aventurine, Carnelian, Chrysoprase, Helliotrope, Mtorolite, and Onyx. Many of the brightly colored Chalcedony available for purchase in the gemstone market is dyed or treated to enhance color, giving us an even greater range of fabulous colors. In UV light, many varieties of Chalcedony appear fluorescent. Humans have been making good use of Chalcedony since the Bronze age. In the Mediterranean region many surviving examples of intricate seals depicting rulers and dignitaries are still in great condition. Hot wax does not stick to Chalcedony, which is why it is ideal as this type of tool. Other antique pieces of carved gemstone jewelry and beads are also readily found in the middle and near east from a variety of cultures. In gem lore, Chalcedony is a believed to be a nurturing stone that promotes goodwill and positive relationships. It absorbs negative energy and brings the mind, body and spirit into harmony. 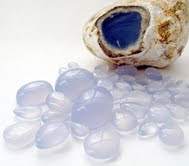 Chalcedony also helps the body to better absorb and assimilate minerals into the veins. It also increases physical energy! Check out these cool varieties of Chalcedony from Layne Designs.